Objective: The purpose of this study was to assess the available pediatric pulmonary services, in terms of workforce, resources, and distribution across Saudi Arabia. This would help in proper utilization of resources and direct future planning. Methods: A cross-sectional survey among pediatric pulmonologists registered in the Saudi Thoracic Society. Results: Among 43 practicing pediatric pulmonologist in Saudi Arabia, 29 have responded to the survey (response rate of 67.4%). The majority of practicing pediatric pulmonologists were young graduates with less than 5 years' experience (44.8%) and were North American training programs graduates (69%). The majority of the respondents (51%) were located in Riyadh, 27% in Jeddah, 14% in the Eastern region and 3% in Madinah and Al-Majma'a. Most of the respondents had access to basic diagnostic tools required in the subspecialty, a majority of them (85%) lack dedicated pediatric pulmonary function laboratories. Nearly, 80% of the hospitals performed less than 50 flexible bronchoscopies/year. Conclusion: Pediatric pulmonology is a growing subspecialty in Saudi Arabia with well-trained and experienced physicians. Our study represents an overview of the available pediatric pulmonology services in Saudi Arabia, which would help in future planning and better utilization of the available resources. Over the last century, medicine has undergone significant advancement particularly in relation to disease understanding, diagnostic modalities, and therapeutic interventions. This resulted in a huge expansion in the amount of knowledge and competencies related to specific disease state or particular patient age groups. As a consequence, the second half of the 20 th century witnessed the birthday of many sub-specialties in the major disciplines of medicine. It goes without saying that, availability of pediatric pulmonary services will ensure the readiness of health-care system to provide children with the necessary requirement for the well-being of their respiratory system. However, stakeholders of health-care system should be aware that it is not only the "availability" of pediatric pulmonologists, but also the "efficiency" of the care being provided at national level. In order for any sub-specialty to be efficient in addressing the national needs, several conditions are required, which include: Availability of enough manpower (not only pediatric pulmonologists, but also respiratory therapists and specialized nurses), resources (laboratory medicine, pulmonary function testing (PFT), medical images, bronchoscopy, and special medications or devices), and finally a system to regulate the practice. It is of extreme importance to have "appropriate" distribution of manpower and resources (per nation population) to match a given country national needs. In Saudi Arabia, even though pediatric respiratory medicine specialty was practiced since the early 1980's, the number of specialized physicians has only grown substantially in the last decade. In this study, we aim to have an overview of the available pediatric pulmonology services in Saudi Arabia in terms of: Workforce, resources, and distribution, which would help in better utilization of resources and to help in future planning. This survey represents the initial research work of the research task force of the Saudi pediatric pulmonology group (SPPG), a subsidiary of the Saudi Thoracic Society (STS). A 5-page survey was prepared by members of the SPPG research committee. The components of the survey were designed based on the input of a focus group, which includes all the authors of this paper. An initial draft of the survey was sent to a group of sub-specialists in the same field and based on the feedback a final survey was designed. The survey was distributed to all pediatric pulmonologists registered in the STS through its official E-mail list. The survey was reinforced by direct communication with pediatric pulmonologists in person while attending activities related to the group. The initial distribution was in January 2012, with a follow-up in July 2012 for those non-respondents. A total of 29 respondents participated from 43 known pediatric pulmonologists practicing in Saudi Arabia at the time of the study (67.4% response rate). Descriptive statistics in the form of frequencies and percentage were used to analyze data. Bar and pie chart were used to express the distribution of some variables. Based on national census data accessed from the department of statistics and information physician-to-child ratios were calculated. These ratios were compared with similar data from US. A total of 29 surveys were analyzed, 22 respondents were Saudi nationals and 7 non-Saudis working in Saudi Arabia. Twenty four of the respondents are males, whereas 5 of the respondents are female pediatric pulmonologists. 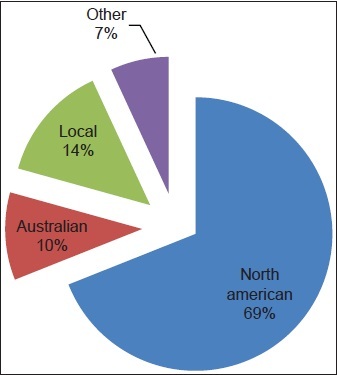 Most of the pediatric pulmonologists were located in the central region (Riyadh 15 physician's, Jeddah 8, Madinah 1, Majma'a 1 and Eastern region 4) [Figure 1], twenty physicians were North American trained (69%), three were trained in Australia (10.3%), four were locally trained (13.8%) and two were trained in United Kingdom and Germany (6.9%) [Figure 2]. The post training experience of the physicians at the time of conducting the survey was; 13 physicians had <5 years' experience, 5 had between 5 years and 10 years' experience, 7 had between 10 years and 15 years' experience and 4 physicians had more than 15 years' experience. Nine physicians had a private practice (31%). The physicians were distributed in 20 hospitals around the kingdom [Table 1] for basic characteristics of respondents]. A separate pediatric pulmonary service was present only in 11 hospitals (55%). A pulmonary function laboratory was available in most hospitals, but only 3 hospitals (15%) had a separate pediatric laboratory; the other 16 hospitals had a laboratory, which was combined with an adult service. The pulmonary function tests offered were: Simple spirometry in all of them, lung volumes in 16 hospitals (80%), the diffusing capacity of the lung for carbon monoxide in 15 hospitals (75%), bronchial challenges in 13 hospitals (65%), overnight oximetry in 14 hospitals (70%), and exhaled nitric oxide in 5 hospitals (25%). Flexible bronchoscopy was performed in 16 hospitals (80%), mainly by pulmonologists, but the number of procedures was less than 25 bronchoscopies/year in 44% of the hospitals, 6 hospitals (37%) had an average of 25-50 bronchoscopies/year while only 3 hospitals (19%) had more than 50 bronchoscopies/year. Almost all respondents had basic diagnostic tools such as chest X-ray and computed tomography (100%) and chest ultrasound in (95%). Ventilation-perfusion scan were available in 14 hospitals (70%). All respondents had access to respiratory therapist and pediatric surgeons. Asthma educators were available in 17 hospitals (85%), thoracic surgeons in 16 hospitals (80%), speech pathologist in 15 hospitals (75%), home-oxygen care was available in 15 hospitals (75%) while home ventilatory care was available in 8 hospitals (40%). Respiratory hospital based protocols were present in all centers. Allocated respiratory beds were only available in 6 hospitals (30%). Nearly, 50% of the hospitals performed sleep studies. All respondents conducted at least one general respiratory clinic a week in their institutes with an average seeing 15 patients per clinic. Some hospitals had more specialized respiratory clinics such as an asthma clinic in 14 hospitals (70%), a cystic fibrosis and chronic lung disease clinic in 5 hospitals (25%). Respondents spent an average of 60% of their working hours dealing with clinical issues, 17% of their time teaching, 15% spent in administration, 5% on research, and 3% on other issues. Most of the pediatric pulmonologist (75%) were also asked to cover general pediatrics service. Pediatric pulmonologists in Saudi Arabia, similar to other sub-specialists in other disciplines in the country, function within different organizations. Majority of these physicians practice under governmental sectors, which can be divided into: Ministry of health hospitals, University hospitals, tertiary independent governmental hospitals, health services related to governmental sectors, e.g. armed forces, national guard, and others. There are few of these physicians practice in the private sector (either full or part time commitments). There is no clear policy governing the relationship between these different organizations as every sector determines the plans and regulations of operation independent of others. There is a huge room for collaboration between health sector organizations in Saudi Arabia that will not only improve patient care but will enhance positively other areas, e.g., research, training, and resources utilizations. Non-profit, professional organizations (e.g., the SPPG ) have the potential to fill this gap of collaboration (this article is basically an example of this collaboration). The pediatric pulmonology services in Saudi Arabia have been steadily growing over the last couple of decades. The number of pediatric pulmonologist in Saudi Arabia has been increasing with a current estimate of 1/630,000 populations. A Canadian survey  estimated that approximately one pediatric pulmonologist is needed for every 360,000 population, suggesting a need to almost double the number of physicians available in the kingdom to provide optimum service. The shortage in pediatric pulmonologists has been globally observed, for example there are 4 states in USA with no certified pediatric pulmonologists. Taking this into consideration, obviously the number of pediatric pulmonologist in the capital Riyadh has reached this standard with approximately 1/340,000 populations as per last national census conducted in 2010. [Table 2] shows a comparison between selected geographical areas in Saudi Arabia and USA,  which confirms significant shortage of pediatric pulmonologists in Saudi Arabia. There is also significant variability in the distribution of pediatric pulmonologists over the different geographical regions of Saudi Arabia. For example, in Riyadh region the physician-to-child ratio is 0.8/100,000 children while it is zero in regions like Qassim or Aseer. As a result, there is a need to recruit more pediatric pulmonologists and to ensure appropriate distribution to serve peripheral areas in the kingdom especially in the northern and southern regions. The newly structured Saudi board of pediatric pulmonology has added to the number of certified physicians joining the workforce. As of now, there are 7 fellows enrolled in the program, hopefully this will help to overcome the shortage of available slots of training in international programs as currently there is only 3 Saudi physicians training in Canada. Presently, the majority of the physicians are North American trained, the rest are of European, Australian, and local training certificates. Most pediatric pulmonologist are struggling to establish the specialty in their hospitals. Only half of the hospitals who employ pediatric pulmonologists had a separate pediatric pulmonology unit with allocated beds. The majority of pediatric pulmonologist (75%) will cover general pediatric consultations in addition to their usual work. Even though, most hospitals had a pulmonary function lab with complex services, a pediatric pulmonary function laboratory was only available in 3 hospitals. This indicates the need for establishing such units with experienced staff in dealing with pediatric patients. Setting standards for accreditation of these laboratories by bodies such as the STS or the Saudi Society for Respiratory Care is crucial to attain such a goal. Pediatric flexible bronchoscopy is used for a wide range of indications and is increasingly used in many contexts, including pediatric and neonatal intensive care. Surprisingly, the services are available in the majority of the hospitals; unfortunately almost 80% of hospitals with pediatric pulmonologist had less than 50 bronchoscopies/year, this finding might reflect small load of patients, low complexity of cases or decreased utilization of bronchoschopy. Keeping in mind that according to the American College of Chest Physicians, 25 bronchoscopies/year is the minimum acceptable number of scopes to maintain competency,  almost 43% of the respondents didn't meet this standard. Pediatric sleep medicine is relatively a new branch in medicine with marked improvement for the last two decades in pediatric patients. It is encouraging that 60% of the centers are conducting the sleep service; however, quality of the technologist and the sleep lab standards were not fully analyzed. Seventy percent of the centers had overnight pulse oximetery. It is a simple and non-invasive modality used to assess the degree of hypoxia  and screening for common pediatric sleep disorders. It is used as a tool to assess the need for home oxygen. Exhaled nitric oxide is a new technology adopted to diagnose eosinophilic airway disease. Based on our survey, exhaled nitric oxide is available only in 25% of the surveyed hospitals in Saudi Arabia. Other basic ancillary services such as a respiratory therapist, asthma educators, pediatric and thoracic surgeons and speech pathologist are mostly available, which would help the pediatric pulmonologist to provide ideal care for their patients. Adding the "pediatric" experience or certification is crucial to provide optimal service. Respiratory research is one of the main deficiencies not only in Saudi Arabia, but in the whole Gulf region. 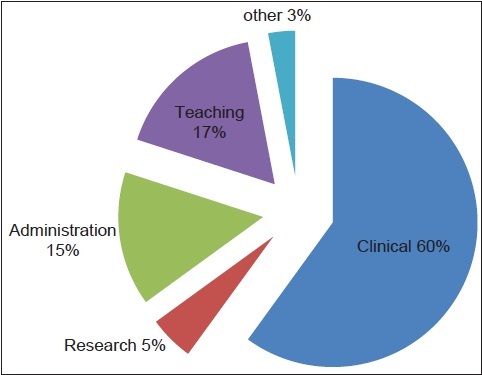 One of the main reasons for this is the low percentage of working hours spent in research, which could be due to the high demand for clinical work [Figure 3]. Recruiting more physicians to the specialty may free some time for research, which would benefit both patients and physicians. Research training is also lacking and our national fellowship program should focus on this competency as a mandatory one during training. The specialty of pediatric pulmonology is a relatively newly recognized area in pediatric medicine world-wide. Structured and organized fellowship training programs around the world and recently locally has produced a relatively reasonable number of pediatric pulmonologist in Saudi Arabia. Most of services related to the specialty are available within the kingdom's main cities though we need to extend to other populated areas in the north and south of the country. There is a need to further develop the infrastructure by providing more space and staff for ancillary services like pulmonary function laboratories specifically for pediatrics. It would certainly be more beneficial if the laboratories were subjected to an accreditation process by a recognized body such as the STS, which would help standardize the procedures around the country for better quality. Boosting research is a necessity, perhaps this would be attained with the growing number of physicians in the specialty and collaborations with national and regional research networks. Information provided by our study is useful not only to those studying workforce trends, but also to medical students and pediatric residents making career decisions. However, this information does not address the need for medical services. 2. Mulholland K. Global burden of acute respiratory infections in children: Implications for interventions. Pediatr Pulmonol 2003;36:469-74. 3. Gappa M, Ferkol T, Kovesi T, Landau L, McColley S, Sanchez I, et al. Pediatric respiratory medicine - An international perspective. Pediatr Pulmonol 2010;45:14-24. 4. Chernick V, Mellins RB. Pediatric pulmonology: A developmental history in north america. Pediatr Res 2004;55:514-20. 5. Godfrey S, Carlsen KH, Landau LI. Development of pediatric pulmonology in the United Kingdom, Europe, and Australasia. Pediatr Res 2004;55:521-7. 6. Cockcroft DW, Wensley D. Respirology manpower in Canada: A report for the Canadian Thoracic Society Education Committee. Can Respir J 2000;7:451-5. 7. Althouse LA, Stockman JA 3 rd . Pediatric workforce: A look at pediatric gastroenterology data from the American Board of Pediatrics. J Pediatr 2006;149:560-562. 8. Highlights from Population Census 1431AH (2010); Central department of statistics and information; Kingdom of Saudi Arabia; from URL: http://www.cdsi.gov.sa/2010-07-31-07-00-05/cat_view/31-/138-/342-1431-2010/300-/343-/310. [Last accessed on 2013 Apr 28]. 9. Highlights from demographics survey 1428AH (2007); Central department of statistics and information; Kingdom of Saudi Arabia; from: URL: http://www.cdsi.gov.sa/socandpub/manpower/cat_view/37-/43-/77-1428 [Last accessed on 2013 April 28]. 10. Midulla F, de Blic J, Barbato A, Bush A, Eber E, Kotecha S, et al. Flexible endoscopy of paediatric airways. Eur Respir J 2003;22:698-708. 11. Ernst A, Silvestri GA, Johnstone D, American College of Chest Physicians. Interventional pulmonary procedures: Guidelines from the American College of Chest Physicians. Chest 2003;123:1693-717. 12. Dayyat E, Kheirandish-Gozal L, Gozal D. Childhood Obstructive Sleep Apnea: One or Two Distinct Disease Entities? Sleep Med Clin 2007;2:433-444. 13. Foo JY. Pulse transit time in paediatric respiratory sleep studies. Med Eng Phys 2007;29:17-25. 14. Brouillette RT, Morielli A, Leimanis A, Waters KA, Luciano R, Ducharme FM. Nocturnal pulse oximetry as an abbreviated testing modality for pediatric obstructive sleep apnea. Pediatrics 2000;105:405-12. 15. Keens TG. Postdoctoral fellowship training in pediatric pulmonology in the United States of America. Paediatr Respir Rev 2010;11:66-7.